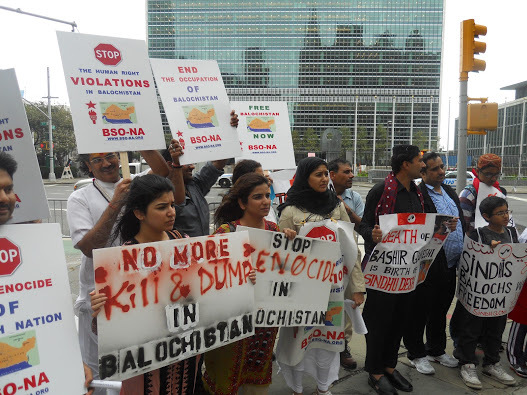 United Nations, Sep.21 (ANI): Baloch leaders and activists held a protest rally in front of the United Nations headquarters in New York to demand international intervention to resolve the Balochistan crisis. The rally was organized by the Washington-based Baloch Society of North America (BSO-NA), the Balochistan National Congress (BNC) and the Moscow-based Baloch Unity Organization, and was attended by representatives of Baloch, Sindhi, Pashtun and Hindu communities living in North America. Dr. Jumma Marri, the President of the Baloch Unity Organization, came all the way from Moscow to attend the protest. "The ongoing Pakistani and Iranian military aggression, gross human right violations, war crimes and Genocide have surpassed all limits", a statement issued by Baloch Society of North America said. Dr. Wahid Baloch, the President of BSO-NA and chief organizer of the rally, called upon United Nations Secretary General Ban Ki moon and other world leaders to intervene in Balochsitan in order to save Baloch lives. "Balochistan was never a part of Pakistan or Iran, but an independent sovereign state, and was illegally occupied, divided and forcefully annexed into these countries against the Baloch will and consent. Both Pakistan and Iran are in violation of international law by occupying Balochistan illegally against the Baloch will and consent," claimed Dr. Wahid. He added "We want an end of the illegal occupation and re-unification of our land Balochistan. We are one Nation as Baloch. We have been divided by artificially drawn borders, which we do not recognize. These artificially drawn borders are separating us from our friends and families", he continued. Dr. Marri called upon the United Nations to put pressure on Pakistan to comply with conventions on enforced disappearance and torture it brazenly refuses to sign. "This attitude has encouraged Pakistan to flout all laws and norms regarding human rights and civil liberties in Balochistan", said Dr. Marri. He added," The situation in Balochistan is no secret, because even the Chief Justice of its Supreme Court laments the human right abuses and extra-judicial killings by the premier intelligence agencies, the Army and the Frontier Corps. He, on record, has blamed them and summoned them to court, but the abductions, killing and subsequent dumping has not only continued, but increased substantially." The protest rally was also addressed by several prominent Sindhi, Pashtun and Hindu community leader and activists. Mashal Khan Takkar, the Founder of Great Afghanistan Movement (GAM), in his speech said that all Pashtuns stand by their Baloch brothers in their quest for freedom and justice. He said that the Baloch-Pashtun have had strong bonds of brotherhood for centuries. Dr. Ghulam Nabi Unar of Jeay Sindh Qaumi Mahaz and Habib Bhutto, the central acting president of Jeay Sindh student Federation, deplored Pakistan's atrocities and human right violations in Sindh and ask for a full U.N. investigation of their leader Bashir Ahmaed Qureshi's murder by Pakistan agencies. "The U.N. must pressure Pakistan to respect the rights of Hindus and the rights of all other minorities in Pakistan and provide them full safety and security", he demanded. Arshad Umrani, the president of Balochistan Strategy Forum, USA (BSF), who came from Chicago with Hammal Baloch and Qurratulain Umrani to join the protest, denounced Pakistan's state terrorism against the Baloch and Sindhi people in Sindh and Balochistan and reiterated his full support for Baloch people. The protest in New York coincided with the ten-day long visit of a five member U.N. Working Group on Enforced Disappearances comprising Olivier de Frouville, the Chair-Rapporteur in Pakistan. Ronan Mcmahon Just over a decade ago Argentina spectacularly unraveled with the biggest default in history — $100 billion. Dollar deposits were converted to pesos. Then, overnight, the peg of one-to-one with the dollar was broken. The unpegged currency immediately devalued. Savings were wiped out. Banks were set alight and locals took to the streets in protest. That crisis created the biggest buying opportunity of a decade. During the ?re sales you could have picked up a historic, high-end property in Buenos Aires or a vineyard in Mendoza for a song. Today, Argentina is back in a bind. There is a strong possibility of another crack-up within the next year. And then we'll have the same opportunity we had a decade ago. The signs are all there. The streets of Buenos Aires have recently seen the return of the backstreet currency exchange. According to the of?cial exchange rate, which is subject to capital controls, 4.4 pesos buys you a dollar. But on the street people are happy to pay up to 6.7. In?ation runs at 25%. The purchasing power of an Argentine's peso savings is going down by one-quarter each year. The government claims in?ation is 9.9% and has outlawed calculating or quoting any other in?ation rate. Forty percent of dollar deposits have been withdrawn from Argentina since last October. Now there are capital controls. You need special permission to move your dollars overseas. But a lot of Argentines' dollars and pesos don't reside in bank accounts. Property transactions typically take place in special rooms in lawyers' of?ces, and they're a cash deal. There's that much distrust of banks. They are ?ne for day-to-day things like paying your electric bill. Not for your savings, though. And these transactions more often than not take place in dollars...if you pay in dollars you could get 25% off the price of property. The government has outlawed this, making the buying and selling of real estate in dollars illegal. Just one more rule Argentines will ?nd their way around. By some reports, if an Argentine company complied with all the taxes and tariffs it faces, they would eat up more than the company's pretax pro?ts. So the shadow economy thrives. By necessity, it seems, rather than greed to pay less tax. Middle-class day-trippers take the ferry to Uruguay to put their savings in deposit boxes. The rich spend millions on condos in Punta del Este, Uruguay. For Argentines, real estate is their bank. They understand in?ation and expropriation from bank and pension accounts. If they have some spare cash, they'll buy an apartment. Or a beach home across the Río de la Plata in Uruguay. Or a condo in Miami. Now fewer Argentines are using local real estate as a hedge against in?ation. New construction and permit applications have fallen off a cliff. They just want their cash out. The government claims that the rate of out?ow has slowed. But with every passing week, companies and individuals ?gure out new ways to get their cash out. For instance, companies buy ?nancial instruments locally in pesos that they immediately resell in New York for dollars. Argentines have seen it all before. When a government and a banking system take your life's work with the stroke of a pen, you don't forget. If you're lucky enough to rebuild your savings, the next time you will be ready. And the harder the Argentine president, Cristina Kirchner, tries to keep assets in the country, the more they'll be siphoned out. Meantime, Argentina is all but frozen out of international debt markets. The government hasn't reached a settlement with the group of creditors (known as the Paris Club) since its last default. So the country and the banking system desperately need these deposits to stay a?oat. But they continue to do incredibly dumb things. Two years ago President Kirchner seized private pension accounts. Now she is going to lend $4.4 billion of this money, at a rate of one-tenth the in?ation rate, to new home buyers. A lottery will decide who gets the loans — not capacity to repay. It's one crackpot idea after another. And the cycle repeats. Expropriating your citizens' savings or international companies like YPF (a subsidiary of Spanish oil company Repsol), which President Kirchner nationalized last April, might buy you some time. But not much. The writing is on the wall. In the last crisis, the trigger event was Argentina's massive default on its sovereign debt. This time around Argentina doesn't face that scenario. Government spending has to be funded from printing presses, taxes, and expropriation of personal or company assets. It's hard to see how the government can collect more taxes. The printing presses are already causing the in?ation and the rush to backstreet currency-exchange brokers. There's a limit to what you can expropriate. This time around the trigger event for a full-scale crisis will be the country's running out of hard currency. There will be no money to pay for imports. Argentina can make do without more Porsches and Gucci handbags, but the country will grind to a halt if industry and energy-producers can't get their hands on crucial imports. The factories will shut. Things will have to get really bad before we're in a "buy" situation. Pay attention if you turn on your TV and see news ?ashes of burning banks and of factories that don't have hard currency to buy raw materials, locking out their workers. If you turn on your TV a second day and see similar reports, then book your ?ight. Your dollars will go a long way. Comparisons between the high-end neighborhoods of Paris and Buenos Aires are correct. It's a world-class capital with a wealth of cultural activities, ?ne dining, and shopping. Buy when the Argentine capital is in turmoil and you'll be sitting on prime real estate in one of the world's ?nest cities. If you've ever dreamed of owning your own vineyard, I can think of no better place than Mendoza, Argentina's most famous wine-producing region. Mendoza sits at the foot of the Andes, 600 miles west of Buenos Aires. Soil and climate are perfect here for wine production. Argentina long held promise. In 1900 it was the world's sixth- richest country — richer than the US. Immigrants ?ooded from Europe. The British came to build the railways. They brought along Irish and Italians. The Spanish came. What followed is text-book mismanagement. When it comes to a head again, we'll have a full- blown crisis. And an opportunity to pounce once more. The obnoxious anti-Muslim film produced by someone in the US and disseminated through the Internet has already caused five days of daily ant-US demonstrations in Chennai. 2.Muslim youth of Chennai did not react in such a vigorous manner over the US invasion of Iraq in 2003, during the visit of former US President George Bush to India in 2006 and against the cartoons published by a Danish journal in September 2005 projecting the Holy Prophet of Islam in negative colours. 3.The surprisingly angry reaction of the Muslim youth this time could be attributed partly to the fact that the film is much,much more obnoxious than the Danish cartoons and partly to the feeling that the Government of India has not reacted against the film as vehemently as it should have.The anger in sections of the Muslim youth of Chennai also reflects the growth of religious activism among the Muslim youth in educational institutions and the dilution of the control of the elders of the community over the angry youth. 4. There are over 20 Muslim organisations in Tamil Nadu with different political agendas and objectives.The Muslim political consciousness movement in Tamil Nadu has been widely splintered. It continues to be so. However, whereas the elders constituting the leadership of these organisations are still splintered, the youth of these organisations have shown a readiness to come together and work jointly for common Islamic causes. 5. The anger of the youth belonging to different organisations ( their number is estimated at around 5000 ) has had certain characteristics that need attention. Initially, the expression of anger started in the colleges and subsequently it spread to schools.The protests attracted a number of Muslim women from colleges and schools who took to the streets in solidarity with the boys.On the fifth day on September 18,2012, some of the clergy in charge of prayers in some of the main mosques of the city were also reported to have joined. 6.On the evening of September 18, when the elders tried to persuade the youth to go back to their mosques for their evening prayers, many of them in a spontaneous gesture of Islamic solidarity prayed in the middle of the Anna Salai (road) totally disrupting traffic. An incident like this has not happened before. Details of the protests on all the five days underline the difficulties increasingly faced by the elders of the community in persuading the youth not to violate the law in expressing their anger. 7. The youth disregarding the appeals of the elders violated the law in various ways --- like acts of vandalism in and around the US Consulate-General on the first day, burning in the streets US flags and pictures of President Barack Obama on all the days and clashes with the police when they tried to prevent them from marching to the Consulate. The Chennai Police seemed to have been taken by surprise by the intensity of the anger and by the orchestrated manner in which attempts were made to give expression to it. 8. While there was apparently an attempt at competitive instigation of the anger by different organisations and youth groups from different educational institutions, the anger was kept directed against the US Government and President Obama without letting it degenerate into anger against US nationals living and working in Chennai. The anger was directed against the US Consulate as representing the US government, but not against other US establishments such as business houses. 9. The youth leaders also saw to it that the anger did not assume a communal dimension. There seems to be an anxiety among some leaders of the Muslim community that the anger could assume a communal dimension in the coming days as the VinayakChaturthi is observed. They have appealed to the youth to discontinue their protests and return to their classes. It remains to be seen whether the youth heed their appeals. 10. The Chennai Police has been doing well under tremendous pressure. They should step up their intelligence collection efforts and intensify their interactions with the influential members of the Muslim community---young and old—in order to seek their cooperation in mitigating the anger. The central intelligence agencies should pay more attention to the phenomenon of Muslim youth activism in Chennai. Last week, four American diplomats were killed when armed men attacked the U.S. Consulate in Benghazi, Libya. The attackers' apparent motivation was that someone, apparently American but with an uncertain identity, posted a video on YouTube several months ago that deliberately defamed the Prophet Mohammed. The attack in Benghazi was portrayed as retribution for the defamation, with the attackers holding all Americans equally guilty for the video, though it was likely a pretext for deeper grievances. The riots spread to other countries, including Egypt, Tunisia and Yemen, although no American casualties were reported in the other riots. The unrest appears to have subsided over the weekend. The intervention in Libya, which I discussed in The Immaculate Intervention, was built around an assumption that has little to do with reality -- namely, that the elimination of tyranny will lead to liberty. It certainly can do so, but there is no assurance that it will. There are many reasons for this assumption, but the most important one is that Western advocates of human rights believe that, when freed from tyranny, any reasonable person would want to found a political order based on Western values. They might, but there is no obvious reason to believe they would. For the Libyan jihadists, tapping into anger over the video was a brilliant stroke. Having been in decline, they reasserted themselves well beyond the boundaries of Libya. In Libya itself, they showed themselves as a force to be reckoned with -- at least to the extent that they could organize a successful attack on the Americans. The four Americans who were killed might have been killed in other circumstances, but they died in this one: Gadhafi was eliminated, no coherent regime took his place, no one suppressed the radical Islamists, and the Islamists could therefore act. How far their power will grow is not known, but certainly they acted effectively to achieve their ends. It is not clear what force there is to suppress them. It is also not clear what momentum this has created for jihadists in the region, but it will put NATO, and more precisely the United States, in the position either of engaging in another war in the Arab world at a time and place not of its choosing, or allowing the process to go forward and hoping for the best. Removing Gadhafi was morally defensible but not by itself. Having removed him, NATO had now adopted a responsibility that it shifted to a Libyan public unequipped to manage it. But more to the point, no allowance had been made for the possibility that what might emerge as the national will of Libya would be a movement that represented a threat to the principles and interests of the NATO members. The problem of Libya was not that it did not understand Western values, but that a significant part of its population rejected those values on moral grounds and a segment of the population with battle-hardened fighters regarded them as inferior to its own Islamic values. Somewhere between hatred of tyranny and national self-determination, NATO's commitment to liberty as it understood it became lost. Getting rid of a tyrant when you are as powerful as the United States and NATO are, by contrast, is the easy part. Saddam Hussein is as dead as Gadhafi. The problem is what comes next. Having a liberal democratic nationalist simply appear to take the helm may happen, but it is not the most likely outcome unless you are prepared for an occupation. And if you are prepared to occupy, you had better be prepared to fight against a nation that doesn't want you determining its future, no matter what your intentions are. Our national trait for wishful-thinking often worries me. 2. A rationally argued assumption is an important part of strategic thinking, a wishful thought with no rational basis is not.I had pointed out in some of my articles in the past how we often confuse wishful-thinking for strategic analysis. Some, if not many of those, who have made a name in our country as strategic analysts, are actually wishful-thinkers. There are many wishful-thinkers even in our security bureaucracy. 3. These observations have been triggered by some E-Mailed comments received by me on my article of September 17,2012, asking whether our humiliation of 1962 by China can repeat itself. The majority of those who have argued that the question of another 1962 does not arise have given two reasons, both of which appear to me to be nothing but wishful thoughts. 4.The first is that the Chinese are no longer in a position to spring a trans-Himalayan surprise on us as they did in 1962.The second is that the strong Navy that we have built up since 1962 will act as a deterrent to any more trans-Himalayan adventurism by the PLA. According to them, our Navy is in a position to disrupt Chinese energy supplies across the Indian Ocean and without assured energy supplies the Chinese would not be able to indulge in any adventurism across the Himalayas. 5. I feel uncomfortable with both these wishful-thoughts.Before October 1962, our political leaders had so convinced themselves about the superiority of our Army over the PLA that they thought that all they had to do was to order our Army to thrown out the illegal Chinese posts in our territory in the North-East and it would do so without any problems. Jawaharlal Nehru and V.K.KrishnaMenon, the then Defence Minister, were living in a world of wishful-thinking. 6. Nehru openly went around saying that he had asked the Army to throw out the Chinese.The Chinese took note of his statements, which proved to have been irresponsible in retrospect, and launched a pre-emptive act of retaliation to neutralise our Army's capability for throwing out the Chinese posts and inflict a humiliation on our Army. 7. That kind of wishful-thinking about the relative strengths of the two Armies and Air Forces is fortunately not there now. We take each other's trans-Himalayan capabilities with a lot of realism. Realistic thinking and analysis is the foundation of good strategic thinking. 8.But I notice a new wishful thought clouding our strategic thinking presently and that is about the perceived superiority of our Navy over the Chinese Navy in the Indian Ocean area.I am confident that the Chinese Navy will not be able to disrupt our energy supplies across the Indian Ocean , but I do not share the confidence of those who have commented on my article that our Navy would be able to disrupt Chinese energy supplies and that the realisation of this will deter any trans-Himalayan adventure by the Chinese. 9. The Chinese are realistic geostrategic thinkers and planners. They know energy adequacy could turn out to be their weak point in any future military confrontation with any external power. They have been trying to build up their strategic reserves, diversifying their sources of supply and means of having the supplies reached to them. Their energy security diversification plan speaks well of their strategic foresight. I wish we have similar foresight. 10.So, to think and argue that our Navy has become a deterrent to Chinese designs and intentions would be unwise.Moreover, in our thinking, we should try to visualise what role the Pakistani Navy will seek to play in the event of another military conflict between India and China. We should be prepared with contingency planning for the eventuality that the Pakistani Navy will try to keep some of our ships bottled up near the Western ports so that we can't use them against the Chinese. 11.If there is another military conflict between India and China, it is not going to be a copy-cat of 1962.The PLA is not going to move into our territory on foot and motor vehicles and occupy territory after over-powering our posts as they did in 1962. In my view, the most likely scenario is that copter-borne, specially trained units of the PLA will take our Armed Forces by surprise by undertaking a lightning occupation of Tawang and Itahnagar in Arunachal Pradesh. They will then try to force us to concede Chinese sovereignty over Tawang in return for their conceding our sovereignty over Itahnagar and the rest of Arunachal Pradesh. I also expect that the copter-borne PLA forces will come not from the Tibet Autonomous Region (TAR),but from Qinghai, Gansu or Sichuan. 12. We are now in a better position than we were in 1962 to detect Chinese preparations for a classical military strike from the TAR.Are we in a position to detect and neutralise a copter-borne invasion from bases outside the TAR?What are the other scenarios possible? What would be the options available to us? 13. Those are the questions that we in governmental and non-Governmental circles should examine with our feet firmly on the ground and without any wishful-thinking. 14.My two articles on the forthcoming 50th anniversary of the 1962 humiliation should not be misinterpreted to mean that I have probably lost faith in the possibility of a negotiated solution of the border dispute with China. I have not. I greatly respect the pragmatism of the Chinese political and military leadership. 15. 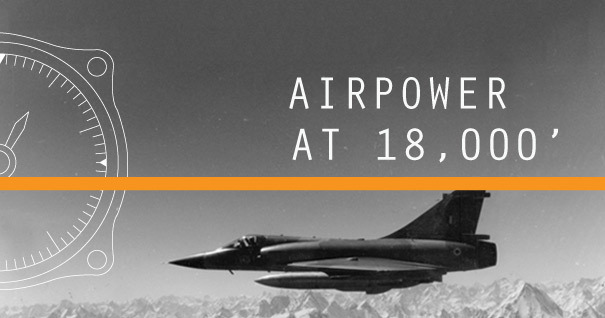 When they initiated the military conflict with India in 1962, they were a poor country with a primitive economy. They did not have to worry about the likely impact of a military conflict on their economy and on the livelihood of their people. 16.Today, China is a major and influential economic and military power itching to catch up with the US.Any military conflict with India could have worrisome impact on their economy. Their interest in keeping their economy sustained and flourishing has made them a cautious power----more cautious than they were in 1962. They would avoid a military confrontation as far as possible. 17. At the same time, I am disturbed to notice the doggedness with which they have been pursuing their territorial sovereignty claims---whether with us in Arunachal Pradesh or with some ASEAN powers in respect of the South China Sea islands or with Japan in respect of the East China Sea Islands. 18. This doggedness should forewarn usthat if an opportunity presented itself they may not hesitate to seek a military solution to the border dispute. The murder of the US envoy and three other diplomatic staff members in Libya on the night of Sept 11 following telecast on YouTube of a film maligning the Prophet, which inflamed sentiments of Muslims worldwide, has given an entirely new dimension to Russian President Vladimir Putin's pre-scheduled visit to Pakistan early next month. As Washington dithers between containing the fallout and flexing muscle in the region by sending troops towards Iran, both Moscow and Beijing (which has cordial relations with Islamabad) are getting ready to assume a greater leadership role in international affairs. Thwarting America's regime change ambitions in Syria and Iran would now be high priority. Moscow and Beijing have already coordinated moves in the Security Council to bar US-NATO from initiating Libya-style regime change in Damascus, and can be expected to intensify resistance to US manoeuvres. On Sept 6, China announced its decision to bypass the dollar for global oil customers and allow them make purchases in yuan. Shockingly, this announcement was ignored by the Indian Media, though it will surely help India's oil purchases from Iran and benefit our overall energy security. [Enhanced FDI in the Indian media can only be to our detriment, and is a move that merits serious reconsideration]. In this fast-changing and evolving international scenario, President Putin will land in Islamabad early October, the first ever Russian head of state to do so. He will end the frostiness induced by the Cold War and kick-start Moscow's new assertiveness in southern Asia where hitherto America enjoyed preeminence. Russia was keen to enhance its profile in the region following India's increased closeness to Washington since the UPA came to power in 2004; though changing events have made New Delhi pause and take a more nuanced stance on several issues. Hence Mr. Putin has no provocation to abandon a traditional ally, and is already scheduled to visit New Delhi in November for the 13th Annual Indo-Russian Summit. On its part, India is keen to have a sphere of influence in Kabul in the wake of the withdrawal of US-NATO troops; Pakistan is determined not to be denied its 'strategic depth'. Russia may be thinking of aligning with Pakistan to get a foothold in Afghanistan to maintain the regional balance of power, just as Iran has been coordinating moves with India. All four nations share concerns that Afghanistan may lapse into a civil war-like condition in the absence of a domestic consensus regarding the future political set up there and the continued fragility of the Karzai regime. Greater regional coordination brokered by Moscow could be in order. Already the neighbourhood is becoming more closely intertwined, with both Moscow and Beijing endorsing Tehran's right to nuclear technology and opposing American sanctions against Iran. 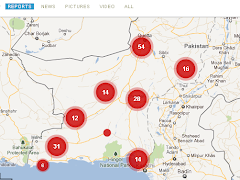 Pakistan, already close to China, will benefit from increased warmth with Moscow in the wake of growing hostility and drone attacks from America. Russia supports Pakistan's desire to join the Shanghai Cooperation Organisation (SCO). Foreign Minister Hina Rabbani Khar visited Russia in February this year to set the tone for Mr. Putin's visit. President Zardari, who had previously visited Moscow in August 2010 to participate in the four-nation summit between Pakistan, Afghanistan, Tajikistan, and Russia on regional security and economic development, went again in May and army chief Gen. Ashfaq Kiyani is going there this month, the first such visit since the advent of the Cold War. Clearly, the region is changing fast. One immediate purpose of Mr. Putin's visit is to discuss the financing of the $1.5 billion Iran-Pakistan Gas Pipeline Project. Russia is also keen to finance the transnational Turkmenistan-Afghanistan-Pakistan-India gas pipeline project, and is negotiating with Iran, China and Russia. Reports say Iran has proposed a plan to lay Pakistan's portion of the pipeline on the basis of 'supplier's credit' whereby Tehran will provide the pipeline and compressors on credit, and Pakistan will make payments after two years. Iran has offered a loan of $250 million on government-to-government basis; Pakistan needs $500 million. In a working group meeting earlier this year, Russia offered $500 million for the Central Asia South Asia electricity project which will bring 1300 MW of surplus electricity from Tajikistan and Kyrgyzstan. This is a continuation of the Russian policy of returning to its "near abroad". Russia needs stability in the Central Asian countries where Islamic terrorism is rearing its head and the terror groups have links inside Pakistan. Enhanced engagement with Islamabad may pay dividends here. Russia meanwhile is continuing to cooperate with Washington on the shipment of NATO equipment out of Afghanistan through the Northern Distribution Network.